I don’t think we did Milan justice. Josh and I missed the opportunity to see AC Milan play Udinese because we didn’t plan ahead and the girls would probably have preferred a fashion week to the pre-christmas weekend we spent in Milan. 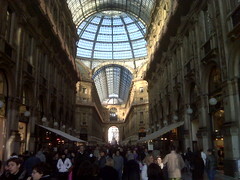 But there’s a lot to recommend about Milan. The Duomo is beautiful and the christmas markets that filled up the Via Dante and the surrounding streets were colorful and fun. We also enjoyed seeing the restored Leonardo painting of the Last Supper. There is something very magical about that painted wall. I also loved the Castello Sforzesco and the Galleria Vittorio Emanuele. Both are awesome structures that leave a strong impression. The food was hit or miss. The hits include panninis at De Santis and a dinner at Bebels. I want to thank everyone who twittered Milan restaurant suggestions to me. We ended up sticking with the reservations we had when we arrived. If we had stayed longer, I would have liked to try a bunch of them. We stayed at the Four Seasons and enjoyed fantastic service and comfort. It turns out Posh and Beckham were staying there as well but we did not get a sighting. That would have been fun. I don’t think Milan can compete with Florence, Rome, or Venice in terms of things to do and see, but it has plenty of the classic italian charm. I’m glad we stopped by for a long weekend and I suspect we’ll be back. If so, I’ll make sure to add San Siro to the itinerary.